Since we didn’t post this news when it occurred, here’s a quick recap of what we missed. 1. 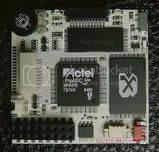 Rom patch database upgrade to 1255. 3. Added RESET function for homebrew. (Patch Enable required) HotKey: L+R+X+Y+A+B. Recommend hold L+R first and then X+Y+A+B. 6. Fixed 1081 unstable problem in patch mode. 7. Fixed 1235 battle-mode halt problem in patch mode. Testing Report of SP4: Press here for the testing report. SLOT 2 SuperCard include: SuperCard CF, SuperCard SD/MiniSD, SuperCard Lite and SuperCard Rumble Series. 1. Fixed some games can not use cheat code problem. 3. 1110, 1158, 1183, 1214, 1240, 1256, 1260 ROMS which can not use cheat code before, work now. New Wii Firmware Update 3.0 A Mod Killer? According to www.vooks.net Nintendo has released a new frimware for their Wii consoles that add alot of minor fixes and updates to the UI but they have also seemingly started to take a stance against moding of their consoles. 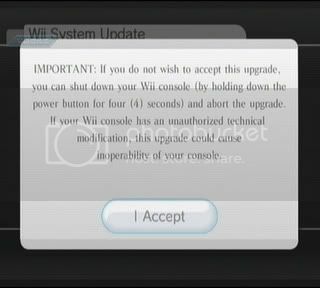 The above warning is what you will see if you choose to do the new Wii update, notice the part about “unauthorized technical modification”. Posted in News | Comments Off on New Wii Firmware Update 3.0 A Mod Killer?